Congress created the Consumer Financial Protection Bureau (CFPB) in the wake of the 2008 financial crisis and tasked the agency with policing consumer financial products broadly, bringing together regulatory responsibilities that were formerly administered by seven different federal agencies. 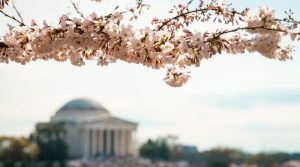 The CFPB brings many industries that were formerly regulated separately—from banks to nonbank lenders to even cellular service providers—all under a single regulatory authority. The agency’s sweeping regulatory powers have been controversial, particularly among conservative lawmakers, especially because the CFPB has many markers of independence that other agencies lack, include independent prosecutorial authority, a funding source outside of typical Congressional appropriations, and a single director who may be terminated only “for cause.” In the agency’s short history, it has aggressively pursued enforcement actions against financial giants and small firms alike. For these reasons, the agency has been a “political lightning rod” since its inception. The CFPB’s controversial position as an “independent agency” only became magnified in October 2016 after a federal appeals court evaluated the agency’s unusual structure and ruled that the agency’s single-director leadership structure rendered the agency’s structure unconstitutional. That case now awaits rehearing and the possibility of further review by the U.S. Supreme Court. Although journalists have covered the CFPB’s enforcement actions, as well as the controversy over the legality of its design, a few exceptional cases have taken the spotlight. Take, for example, the recent case involving the widespread practice among Wells Fargo employees of opening unauthorized accounts, a case which garnered intense scrutiny in the press. Wells Fargo now faces a $100 million fine—the largest civil penalty that the CFPB has imposed to date. Actions such as these are often the subject of critique, with accusations that the agency is “heavy-handed” and overly aggressive on one hand, or lumbering and ineffectual in its enforcement activities on the other. The structure and practice of a state’s administrative apparatus reflect that state’s societal values. Resource limitations force agencies to set enforcement priorities, and thus changing patterns of enforcement demonstrate the evolution of both administrative philosophy and the scope of certain social problems over time. With so much recent focus on the structure of the agency, less attention has gone to analysis of the agency’s more typical on-the-ground enforcement activities. Even a brief look at some recent CFPB enforcement trends as offered here raises many questions about the agency’s operations and suggests many avenues for future research. Under section 1016(c)(5) of Title X of the Dodd-Frank Act, the CFPB must periodically submit to Congress “a list . . . of the public supervisory and enforcement actions to which the Bureau was a party during the preceding year,” including cases in federal court as well as agency administrative actions. This post collects information on all enforcement actions reported in these semi-annual reports, which represented reporting periods from January 1, 2012 through September 30, 2016—a total of more than 132 unique actions. From this data set, this post analyzes the number of new enforcement actions brought over time and what types of actions the agency pursued in each reporting period. Previous studies suggested that the trend in CFPB enforcement actions was a steady increase. For example, a previous study by Bloomberg Law published in 2016 tracked the number of enforcement actions by year through 2015, and from the perspective of that study’s authors, the trend seemed to be increasing steadily. In light of this perceived trend, the results of a fresh look at more recent CFPB enforcement activity is surprising. As shown in the figure below, the number of new enforcement actions declined sharply towards the beginning of 2016 and then leveled. This peak might be explained by the initiation of many investigations several months before, as the agency reached full levels of employment, all of which culminated in new enforcement actions brought at approximately the same time. Or perhaps the 2015 peak represents an overextension of agency resources, and the last year of the reporting period demonstrates a more stable and sustainable rate at which the agency will pursue new actions in the future. Note that the period covered in the graph above ends before both the federal appeals court decision questioning the agency’s constitutionality in October 2016 and the election of a CFPB-unfriendly Republican President in November 2016. Thus, neither of these external factors can account for the decrease in the number of enforcement actions. Next, trends based on the types of enforcement actions that the agency has pursued further evidence changes in the reporting periods from October 2015 to September 2016 as compared to other periods. One notable change is in the proportion of enforcement actions rooted in a prohibition against certain types of compensation arrangements between entities involved in the buying or selling of real estate. The CFPB enforces the Real Estate Settlement Procedures Act (RESPA), and RESPA prohibits payment of unearned fees (such as referral fees) or kickbacks between firms related to the purchase or sale of real estate. This restriction is designed to prevent firms from designing compensation agreements that ultimately increase the cost of mortgage borrowing for consumers. The chart below shows how this type of enforcement action, represented in the chart below as “illegal mortgage-related compensation,” represented a significant portion of new CFPB enforcement actions in each reporting period—until the last year of this study, when these types of actions virtually disappeared. Early emphasis on mortgage settlement procedures likely reflected the public anxieties about mortgage lenders after the steep rise in foreclosures after the financial crisis. With many homeowners underwater on their mortgages in this period, policing of these unlawful settlement procedures that increased the cost of mortgage lending would have had strong public support. But why does the number of these actions decrease after October 2015? 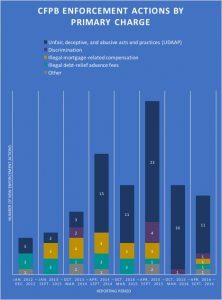 Does this trend reflect effective enforcement—mortgage brokers and affiliates taking care to avoid these types of illegal arrangements, thereby making enforcement actions unnecessary—or simply a shift in the CFPB’s attention away from the business practices of these firms and towards other enforcement priorities? Future research might also investigate enforcement trends within the broad framework of “unfair, deceptive, and abusive acts and practices” (UDAAP), which constitutes a large percentage of CFPB enforcement activities. How have these actions evolved over time? Furthermore, moving beyond a mere summary of initiated actions, a fuller study of the CFPB’s enforcement patterns might investigate the types of remedies pursued over time, including the proportion of fines and penalties to mandates for behavioral change. These questions—and many more—await exploration with more robust investigation of the CFPB’s early history of enforcement in the consumer-financial space. These types of investigations will not only add to understandings about the inner workings of the newest member of the constellation of agencies that make up the American administrative state, but these studies can also move the conversation about the CFPB beyond mere partisan dimensions to one focused with more granularity on the regulation of the consumer financial marketplace in theory and practice. The CFPB assigned some closely related enforcement actions against different defendants unique case numbers, but then reported these cases in a block as a single enforcement “action” in their semi-annual reports. When this occurred, I counted the group of cases as a single event of enforcement. Thus, the 132 enforcement actions discussed above include more than 132 discrete enforcement cases. All semi-annual reports are available on the CFPB’s website. Anna Hrom is a PhD candidate in the Duke University History Department who studies the historical intersections of law, business, regulation, and society. Special thanks to Edward Balleisen, Jessica Brandt, and Ashton Merck for their comments on earlier drafts of this article.